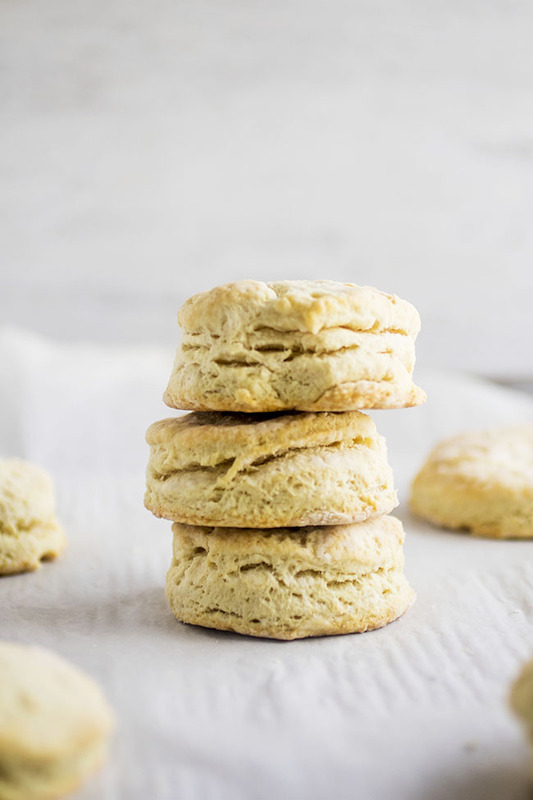 You’ll love this recipe for simple, fluffy vegan biscuits – you won’t even miss the butter! Ready in less than 30 minutes and made with coconut milk and coconut oil for a vegan twist on a classic breakfast recipe. Vegetarian, Vegan. 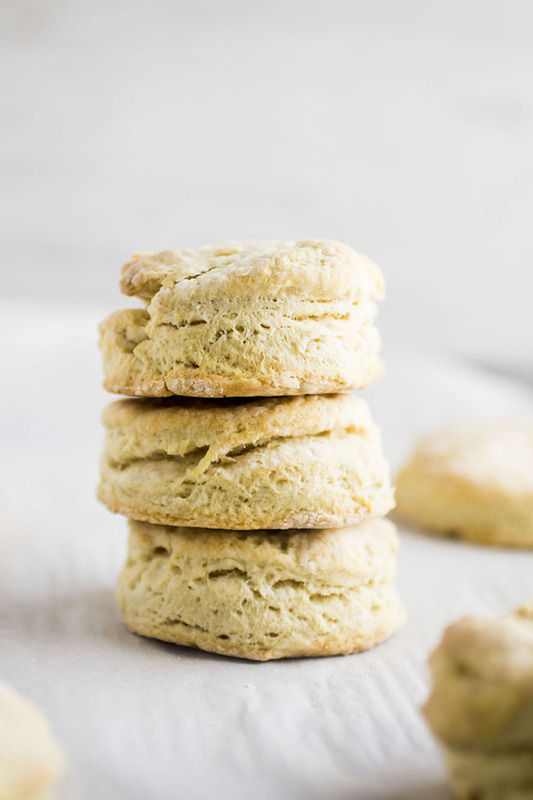 Let’s chat for a hot minute about these incredibly fluffy, soft, flakey, vegan to the V-E-G-A-N biscuits. But also, dear non-vegans in the crowd: stick around! Because I totally promise that you won’t even miss the butter. These here biscuits were born a few months ago when Kyle and I were faced with the classic double whammy of 1) being hungry and 2) not having gone to the store in forever + 1 day. We wanted breakfast! We wanted bread things at that breakfast! We wanted soft, pillowy biscuits to pile high with fried eggs and maybe some sriracha and also maybe some cheeeeese. But we were sort of zip-zippo-zilch and ix- to the double nay-nay in the bread/butter/milk/vegetables department. (Story of our lives. Good thing I don’t have to cook for living, riiiigh – WAIT). When we want biscuits, WE GET BISCUITS. So I improvised, grabbed some assorted coconut things from the pantry (pantry = 1/2 of 1 cabinet that is so full things fall on my head whenever I open it, #foodbloggerproblems) and BOOM. These vegan, ever-so-slight-hint-of-coconut-y, FLUFFY AS ALL FLUFF biscuits were born. These vegan biscuits are made with the same general process as classic buttermilk biscuits: cut the cold coconut oil into the dough just like you’d do with butter, work quickly with the dough so as not to warm it up too much, fold it over on itself a couple of times, pat it down, cut out some rounds, bake until golden brown, stuff the biscuits in your face. I love these biscuits straight from the oven with a generous drizzle of honey, but they’re also great for breakfast sandwiches or as the base to this cajun eggs benedict. They’re also just as flaky (and dare I say…BUTTERY?!) 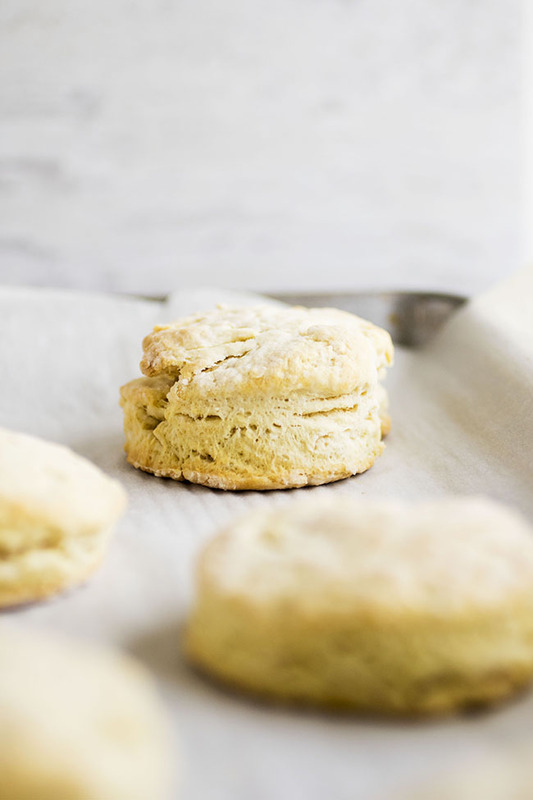 as traditional biscuits, so the vegans in the house get a nice treat without missing the soft, pull-apart layers that make fresh breakfast biscuits so droooool-worthy. PS – Ready in under 30 minutes! Soooooo…winning. Vegan biscuits with coconut oil. Measure coconut oil into a half-cup measuring cup (see recipe notes). Place coconut oil in the fridge until you’re ready to use it. Measure out your cup of coconut milk. If it’s separated at all, whisk quickly to re-incorporate. Place coconut milk in the fridge until you’re ready to use it. In a large mixing bowl, stir together flour, baking powder, baking soda, and kosher salt. Pull coconut oil out of the fridge and add it to your flour mixture. Use your hands or a biscuit cutter to cut the coconut oil into the flour mixture (just like you would with regular butter-based biscuits!) until the mixture is coarse and you have small pieces of coconut oil remaining. Add coconut milk to flour mixture and stir until everything is combined. The dough shouldn’t be completely smooth – we want to keep lots of coconut oil pieces in there so the biscuits will bake up and be nice and flaky. Turn dough out onto a floured surface. If the dough is too sticky, gently fold a tablespoon or two of flour into it until it’s easier to work with. I like to gently fold my dough over on itself several times, so I have lots of coconut oil layers working for maximum flakiness. Remember to work quickly with this biscuit dough, though – don’t let the heat from your hands melt the coconut oil! Roll dough to about 3/4″ thickness and cut biscuit rounds with a 2″ biscuit cutter. Place biscuit rounds on a parchment paper-lined baking sheet and bake at 425 degrees Fahrenheit for 10-15 minutes until lightly browned. 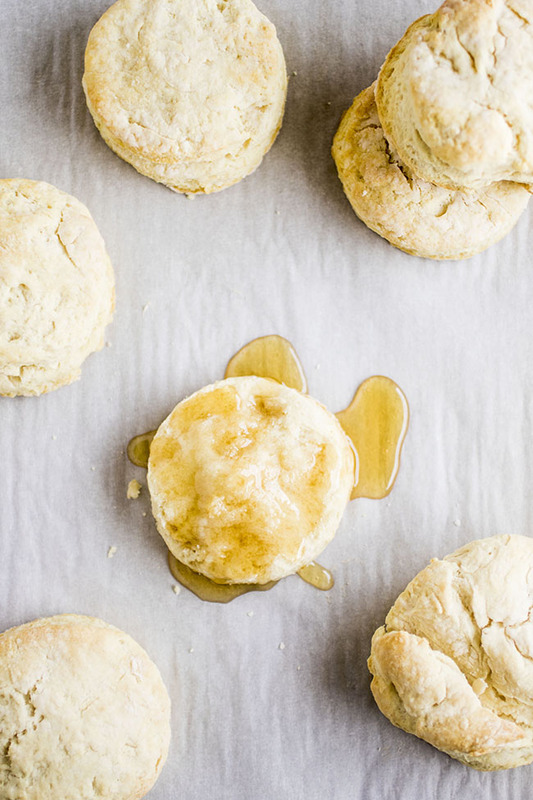 Let biscuits cool for 2-3 minutes, then serve with a drizzle of honey (optional). I measure my coconut oil by spooning the solid oil out of its original jar and into a standard 1/2 cup measuring cup. Use the back of a spoon to pat the coconut oil down into the cup if there are big air pockets, but don’t worry about tightly packing it into the measuring cup. Just get it as close as you can to 1/2 cup! If you don’t want vegan biscuits, you can substitute unsalted butter for the coconut oil and milk or buttermilk for the coconut milk. Work quickly when dealing with biscuit dough so that the heat from your hands doesn’t melt the still-solid coconut oil pieces. Mix up your biscuits by adding fresh herbs, diced jalapeño, or a sprinkle of fresh ground black pepper to the dough before baking! 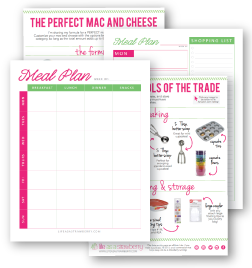 This is a great base recipe and it’s easy to customize. Hi Laura, thank you for the comment. Great to hear it worked out! Absolutely amazing. Tender, melt in your mouth yumminess. I did not have coconut milk, so I substituted some homemade coconut milk yogurt. Will definitely make this again. I used the scraps to make pigs in a blanket for the kids, big hit. These turned out wonderful. I reduced the baking soda shaped the dough into a rectangle and cut into an squares. I love that I can use coconut oil instead of butter or shortening. Thanks for the recipe! Hi Sue! Thank you for sharing! Best biscuits I’ve ever made. They cook better than my butter and buttermilk recipe. 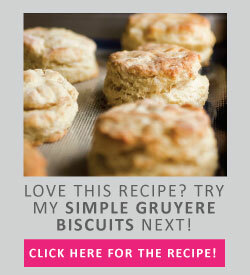 Best of all, the ingredients are non-perishable, so I can whip out biscuits anytime without making trips to the store. I made these biscuits this morning in place of vegan buttermilk biscuits in the hot for food “Vegan Breakfast Trifle” and I loved them. They were buttery, flaky, just so delicious. I made them as you said except I left out the baking soda (because I’ve never been able to bake with it without tasting it), and it didn’t seem to negatively affected at all. I rolled, folded, and re-rolled the dough a few times as you would with pie crust to add to the flakiness and I baked them for 12. I love this recipe! So quick and simple and they taste so good, both on their and in the trifle. I would recommend to anyone trying this out to use less baking powder & soda, even if the rising is affected. So sorry to hear this, Michelle! You can certainly cut down on the leavening agents if you’re especially attuned to the taste. Can I ask what brand of baking powder you were using – were you using non-aluminum varieties? A strong, “tinny” taste can sometimes be associated with standard asking powder that isn’t as pronounced in aluminum-free varieties, which is what I use. 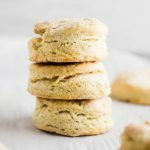 We make these biscuits all the time in a variety of forms and flavors and have never noticed a strong taste of leavening agents, but I can certainly add a note to the recipe as well. Oh and I also used gf flour. It just isn’t the same as the flour package said, ha, of course. Ah! I would guess that’s the culprit, then – this recipe hasn’t been tested with GF flour and it tends to be much more absorbent than regular flour, so the outcome would definitely be different! So sorry to hear that, Donna! We make these every few weeks and have never had a problem. Did you chill the coconut oil and cut it in carefully to preserve some of the pieces (that helps create the flakes)? Biscuits also sometimes have problems rising when they’re rolled out or handled too much, which is why I suggest gently patting the dough into shape when it’s just combined and folding it over on itself a few times to create some nice layers. Regardless of what biscuit recipe I’m using, I find that my technique usually has more of an effect on the outcome than the measurements. Baking soda has a stronger taste to me than powder, which is why there’s just one teaspoon here, but if you don’t like the flavor of leavening agents you can swap some baking soda for the baking powder or even reduce the leavening agents by a teaspoon or two – they won’t rise as much, but you can pat the dough a little thicker and there isn’t an enormous difference. Using quality coconut oil and coconut milk also help here. I hope that helps if you decide to give the recipe another try! The buiscuits came out wonderful. However the taste of the baking powder was overwhelming to me. Do you think they would still come out the same if I reduced the amount by half? Also side note your site freezes and crashes a lot and has lots of advertisements which keeps the page rolling up and down as they load. I’m glad you liked them! The baking powder is what helps the biscuits rise, so reducing it will likely result in flatter, denser biscuits. You could try a different brand of baking powder if you like, or replace some of it with baking soda. You could also replace the coconut oil in this recipe with butter (if you’re not sticking to a vegan diet) to see if you enjoy that flavor more since the coconut oil does generally impart some of its own flavor. I’m sorry if the site froze – were you viewing the recipe on a mobile device? Some phones/networks can have a harder time loading than others, but I can certainly check in with my hosting provider and ad network to double check things on my end. You can also take advantage of the “jump to recipe” button at the top of every post to skip any ads and content and head straight to the recipe. Hope that helps! Thank you for your quick response. I will try to add the baking soda since I am vegan. And yes I was viewing from a mobile phone so went to my lap top and had no problem with viewing. My biscuits are in the oven, finishing up. This recipe was super easy, and took no time to prepare. I used a wooden cutting board with parchment paper, and flour of course to keep the dough from sticking. I also used an old fashioned shot/bar glass. I ended up with 15 biscuits. I also used 1/4 a cup of culinary coconut milk+ 3/4 cup of unsweetened cashew milk. I borrowed from the Minimalist Baker by indented the tops and smearing with warmed vegan butter. They took a little longer in my oven-20min. While I did not get the perfect results,they are super good. I’m so glad you like the biscuits, Brittany! Thanks for letting me know how they turned out! 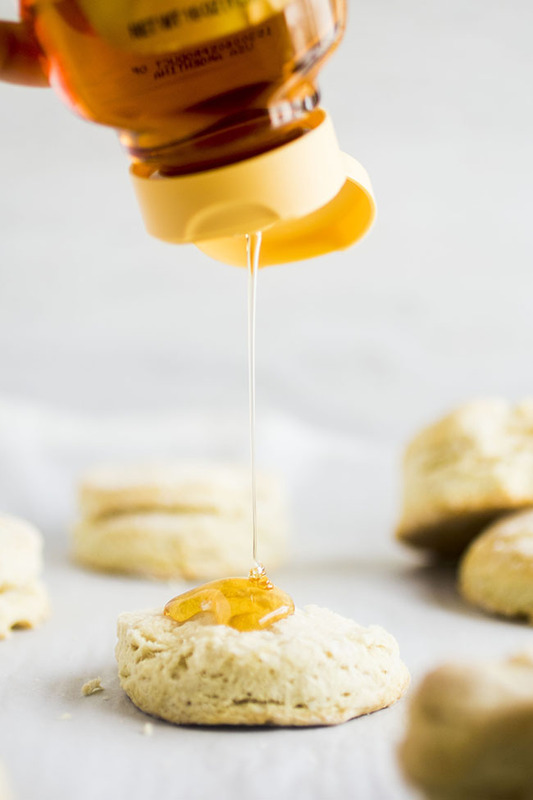 The honey is an optional topping and not mixed in with the biscuits! If you follow a strict vegan diet, you can certainly bake the vegan biscuits as directed and just use an alternate topping. Hi! They look just delicious and I can’t wait to make them RIGHT NOW, but… I have no coconut oil at home. Can I substitute it with olive or sunflower oil, for instance? If you’re out of coconut oil, you can use cold unsalted butter! It’s important that the shortening here be solid, as opposed to a liquid like olive oil, because you need to cut the solid oil or butter into the biscuit dough so that it melts in the oven and creates those nice, flakey layers. I hope that helps! The fluffiness of these biscuits is UNREAL! Can’t wait to try!